Madame Bovary is the book that changed the novel forever. Before Gustave Flaubert published his masterpiece in 1857, readers had become accustomed to characters that were either good or bad, with well-defined roles in a story. But unless you’re Tony Abbott, life is not like that. “No monsters, and no heroes!” Flaubert proclaimed in a letter to Georges Sand. Instead of a hero, Flaubert gave us a novel full of anti-heroes: flawed, selfish characters blind to their own faults, their weaknesses and delusions. He was the first author to anatomise the experience of mediocrity – a depressingly common aspect of the human condition. He would describe this state in language of such brilliance and precision that his story took on an epic quality. The only precedent for this achievement is probably Don Quixote, a book Flaubert revered. For the past 150 years Flaubert’s critics have tried to claim him for one camp or another. To some he was the master Realist who killed off the Romantic novel, to others he was the precursor of the Nouveau Roman, with its near-photographic descriptions. Flaubert, who hated labels, defies categorisation. Madame Bovary retains many elements of the Romantic novel, and is filled with stylistic flourishes unthinkable to the French formalists of the 1960s. It is a novel of contradictions by an author who was never afraid of contradicting himself in letters to friends. All of this makes Madame Bovary a supremely difficult book to adapt for the cinema, for when we lose touch with Flaubert’s language we are left with a production that cannot fail to disappoint the novel’s admirers. It was therefore brave of French-American director, Sophie Barthes, to venture into a field where Jean Renoir, Vincente Minnelli and Claude Chabrol failed to impress. It would be wonderful to say she has triumphed where her distinguished forebears flopped, but in fact she fails pretty comprehensively. Barthes’s Madame Bovary presents a dry, clipped version of the story, shorn of many key elements, including the crucial ball scene where Emma Bovary gets her first glimpse of a more glamorous life. Among other questionable excisions she has left out the Bovarys’ daughter, which diminishes our understanding of a woman who loves the idea of herself as a mother, but is indifferent to the reality. The story of Madame Bovary is so well known I won’t attempt an extended outline. Barthes seems to assume that her audience already knows the plot because she gives away the ending in the the opening scenes before switching to flashback mode. In brief, it is a tale of thwarted desires and adultery set in a claustrophobic hamlet in Normandy. Emma is the ultimate bored housewife, her husband Charles, a provincial doctor with no special talents or ambitions. Her fall from grace occurs through her pursuit of two love affairs and a grand passion for luxury goods which sends the household to the brink of ruin. The power of the story resides in the personalities of Yonville’s leading citizens: Hommais, the pedantic pharmacist, who styles himself as an intellectual powerhouse; L’Abbe Bournisien, the complacent priest; Lheureux, the wily merchant who seeks to entrap his customers with a generous line of credit. These characters build up a composite portrait of bourgeois duplicity and small-mindedness. They are also the best asset for any filmmaker, as they offer fantastic opportunities for an actor. The acting may well be the highlight of Barthes’s adaptation, with the reliable Paul Giamatti playing the pharmacist, and Rhys Ifans giving us a memorable, reptilian Lheureux. The disappointment is that Hommais, who looms monstrously in the novel, is reduced to a bit player in this film. This tends to transform a corruscating satire on the bourgeoisie into a quaint period drama. 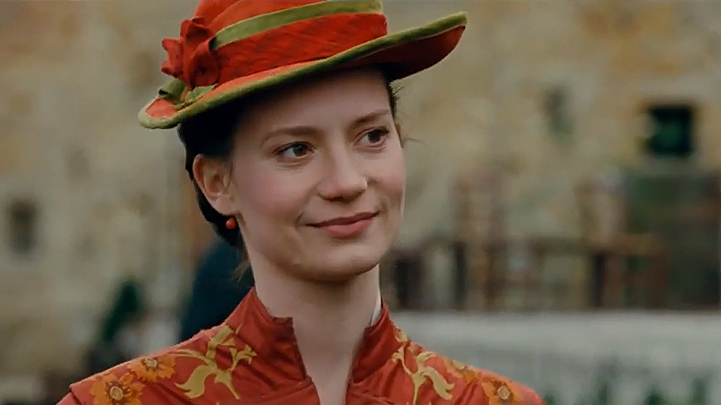 The character of Emma Bovary is the key to any adaptation, and Mia Wasikowska is not right for the part. While she was perfect as Jane Eyre, and even as Robyn Davidson in Tracks (2013), Wasikowska is far too level-headed to play Emma. Jennifer Jones was more vivacious in the Minnelli version, while Chabrol’s favourite actress, Isabelle Huppert, did an excellent job of capturing Emma’s ineffable blend of sensuality and indifference. Like Carey Mulligan in the new adaptation of Far From the Madding Crowd, Wasikowska seems like a girl playing the role of a woman. Mulligan could just about pull it off, but Wasikowska is never convincing. This is no reflection on the quality of her performance, but it’s a hopeless task. The same might be said for Ezra Miller in the role of Emma’s second lover, Leon Dupuis. Leon thinks of himself as a man of passion, but Flaubert reveals him as a bourgeois-in-the-making. Miller’s youthfulness makes him seem more like an impulsive teenager. The viewer who has never read Madame Bovary will most probably see only a wellmade costume drama. This may be sufficient for a night at the movies, but there is no special art in turning a literary icon into a superior soap opera. Flaubert may have fashioned greatness from mediocrity, but Barthes has reversed the process. Published in the Australian Financial Review, Saturday 11th July, 2015.